In this blog post I’ll show you how to use the JJWT library to issue and verify JSon Web Tokens with JAX-RS endpoints. The idea is to allow an invocation when no token is needed, but also, be able to reject an invocation when a JWT token is explicitly needed. Let’s say we have a REST Endpoint with several methods: methods that can be invoked directly, and methods that can be invoked only if the caller is authenticated. There are several ways to authenticate, authorize, encrypt… REST endpoints invocations. Some complex, some easier. Here I will use JWT, or JSon Web Token. The idea is that when authorization is needed, the caller needs to get a JWT token and then pass it around. I won’t go into too much details on JSon Web Token as you can find plenty of resources. I just want to show you some code so you see how easy it is to setup with JAX-RS. The magic hides behind JWTTokenNeeded. Well, not really, it hides behind the JWTTokenNeededFilter. JWTTokenNeeded is just a JAX-RS name binding (think of it as a CDI interceptor binding), so it’s just an annotation that binds to a filter. As you can see on line 22, the JJWT library is very simple as it checks if the token is valid in only 1 line. Validation is made depending on a Key. Here I just use a String to make the example easy to understand, but it could be something safer, like a keystore. Ok, now we have a filter that checks that the token is passed in the HTTP header. But how is this token issued? The user needs to login, invoking an HTTP POST and passing a login and password (here, login and password are passed in clear for sake of simplicity, but this part should use HTTPs). Once authenticated, JJWT is used to create a token based on the users’ login and the secret key (the same key used in JWTTokenNeededFilter). 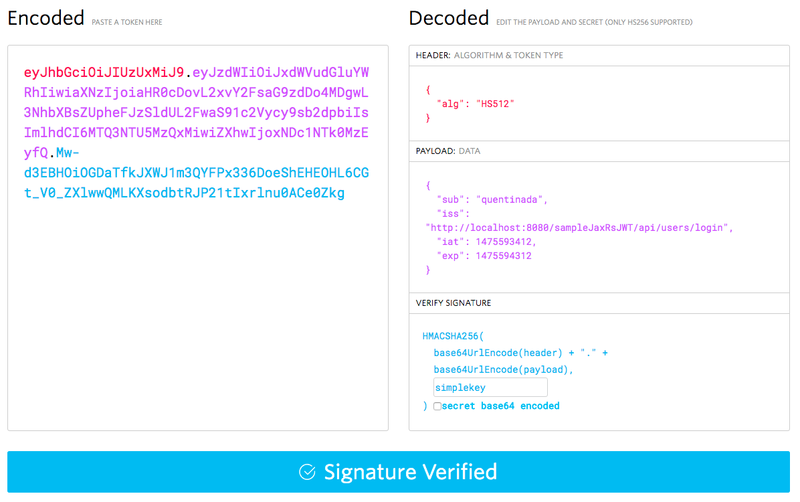 Notice that the JSon Web Token sets a few claims (in the issueToken method): subject (the principal’s login), a issuer (the one who issued the token), an issued date, a signing algorithm, and very important, an expiration date for the token. Now, the client is authenticated, and it has a token that it needs to pass to be able to invoke the Echo endpoint again. Now that you have all the pieces, let’s put them together. After authentication, a JSon Web Token is returned to the client. It is encrypted using the user’s login and a key. So it can then authenticate the user and get the token. As you can see, I’m using JJWT to check that the token has the needed claims. Then, it invokes the same EchoEndpoint but this time passing the token in the HTTP header, and this time gets a 200 OK. In this blog I wanted to show you how easy it is to issue and validate a JSon Web Token with JAX-RS. Here I’m using the external JJWT library as this is not standard in JAX-RS. I find JJWT easy to use but you can find other librairies that do more or less the same (jose.4.j, Nimbus or Java JWT). I didn’t use any security for authentication (security is complex and not very portable in Java EE) so the login/password are not encrypted and no realm is setup. Download the code, give it a try and leave some comments. I’m the creator of the pac4j security engine (http://www.pac4j.org) and in my case, I have authenticated user profiles (with attributes) I want to turn into JWTs to call web services, so I need encryption to protect the personal data of these profiles. And JJWT does not support encryption while the Nimbus library (which is for me the best choice) supports it. “security is complex and not very portable in Java EE”: I could not agree more, this is exactly the idea behind pac4j: make security easy and portable across Java frameworks and we have implementations for J2E, Spring MVC, Spring Security, Vertx, Play and many more. How can I refresh the token when it expires? JJWT and probably all the other libraries cited are also based on the JWE specification, so they do support encryption. I have 2 comments re JWTTokenNeededFilter. In line 17 I’d do a “Bearer “.length() and no .trim(). Second, 401 is for Basic Authentication afaik, I’d use 403 Forbidden instead. Why did you decided to put token into Header in authenticateUser method ? Thank you for the tutorial, this is really pretty straight forward. Which approach would you use, if different endpoints have different permission levels? E.g. echo/jwt/admin, echo/jwt/user and passing the required permission level to the filter. In a JWT token you can pass as many claims as you want. So you can also pass the role of the user (permission) in the token, and each time check if the role is allowed. That’s one simple technic. Thank you, I will have a look at this way! DeploymentScenario contains a target (_DEFAULT_) not matching any defined Container in the registry. Thanks for the post. Is it possible to restrict user access, to a single machine, means after first time login user could not access his account from any other device. Thanks. I am using most of this tutorial code to Create JWT and validate in subsequent request whether token exist. If exist then authorized else redirect to login. I am able to create token but not able to get back it in JWTTokenNeededFilter from ContainerRequestContext. As String authorizationHeader = requestContext.getHeaderString(HttpHeaders.AUTHORIZATION); I am getting null, no token set here. So I am saving the token to browser cookie now. But again failed to get in back here. Also using @cookieParam gettinig exception. Any help will be great for me. Thank in advance. In your code inside filter() method, you’re generating a new signing key when validating an existing token. Shouldn’t this key be a key that was used for issuing a token? Is this code correct or is it meant to be replaced? Hi, we use Java-Servlet 2.X.. but seems like it is trouble some. Anyone has an experience to apply JWT of JAX-RS? was it sucessful? What’s the problem, I also use 2.X and did not find trouble..?